Painted Cottage Style Furniture Swansboro, Emerald Isle & Eastern NC. Creatively Hand Painted Cottage Style Furniture For Your Beach or Cottage Inspired Home In Swansboro, Emerald Isle and Eastern NC. Looking for painted cottage style furniture for your home in Swansboro, Emerald Isle or Jacksonville, NC? Here you can shop in the comfort of your own home for hand painted, shabby chic and cottage style furniture to give your home a cozy feeling. Pick it up in Swansboro or have it delivered locally! Lisa’s proudly serves Swansboro, Jacksonville, Emerald Isle, Morehead City and surrounding areas! Some of our furniture is handmade from scratch using new and Re~used elements. Others are flea market finds that have been lovingly redesigned or upcycled into something beautiful. Do you live in Swansboro or nearby? 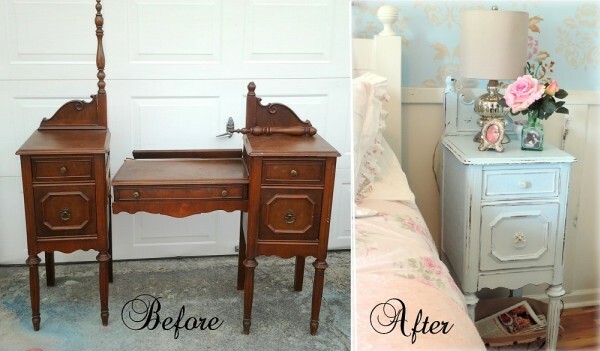 Have a piece of furniture that needs a makeover? Don’t throw it away or donate it! Lisa is happy to do custom work! Please check out my portfolio here. Don’t live on the Crystal Coast? Some of our smaller pieces can be shipped. Contact Lisa for a shipping quote at Lisa@LisasCreativeDesigns.com .